The greatest Lean mystery has now been solved. Since the inception of modern progressive management in the late 1800s, its creators and devoted practitioners have persistently encountered disinterest among corporate executives despite its wide-ranging benefits. The newest form of progressive management, Lean management, also suffers from executive disinterest. Why? Decades of effort to understand this phenomenon has yielded no new insights — until now. 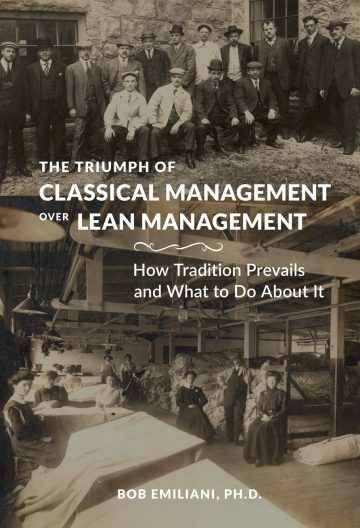 The Triumph of Classical Management critically examines the institution of leadership and solves a major business problem that has endured for more than 100 years. It provides a comprehensive explanation for why executives reject Lean management. It also provides practical solutions for how to gain acceptance for Lean management and an alternative. The findings can also be applied to other types corporate transformation efforts. Deming’s “system of profound knowledge” is designed to enable progress. The Triumph of Classical Management identifies a countervailing force that obstructs progress: the “system of profound privilege.” The two systems work against one another, which is why both Deming’s vision of management and Lean have been so difficult to realize in practice (as has OpEx, Agile, Six-Sigma, TQM, TOC, etc). Therefore, both systems must be recognized and understood to break the logjam and make greater progress. For me, as impactful as Ohno’s Workplace Management and Deming’s The New Economics. A great (if somewhat depressing) analysis of the political, sociological, and even psychological forces that keep executives from embracing lean. It opened my mind to many dimensions of the problem I had not considered previously… Emiliani’s book helps make the problem visible and gets one thinking about some countermeasures, especially in the area of marketing lean better. Click here to read the back story on this book.